I received a few really cool emails today. I'll tell you more about them when they are more interesting for you. Besides that, I'm just counting the days until Thanksgiving break, though I'll probably not be eating turkey this year since we're going to Disney. 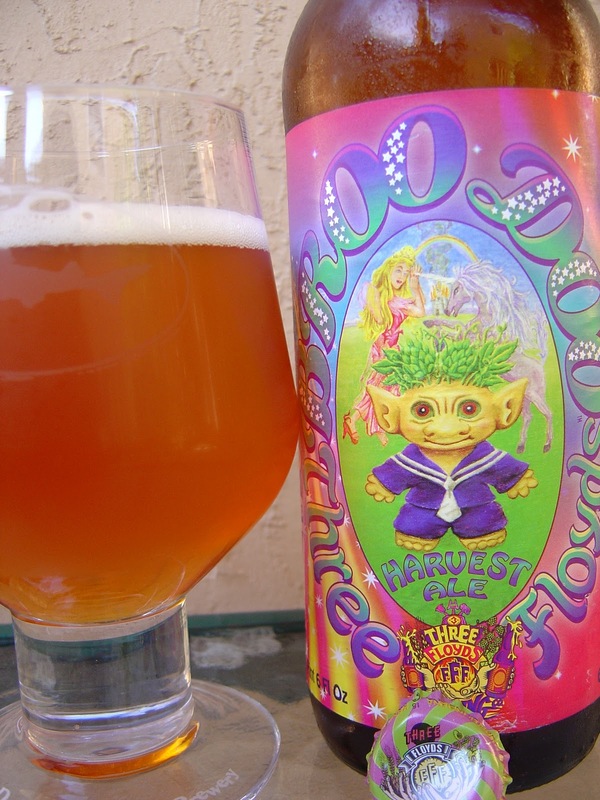 Today I decided to drink Broo Doo Harvest Ale brewed by Three Floyds Brewing in Munster, Indiana. Yep, two days in a row from this brewery, another in the Marathon Marie Series (and she happens to be going there this weekend)! Again, another outstandingly weird label, presentation and colors. 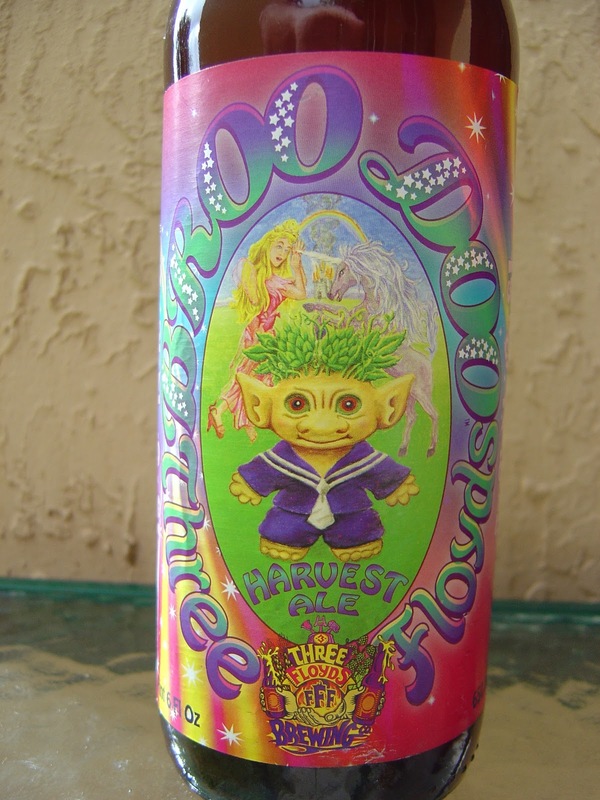 Pinks and yellows and purples and neons and rainbows and princesses and unicorns all surround a troll doll in a sailor suit! Yeah, I was gonna say acid too! The story on the side talks about using fresh green wet hops, from the vine to brewhouse in one day! Marie, there's a map below the story so you can use my picture if you get lost. I see Route 80 on that map! I lived near route 80 in PA growing up and near where it ends at the George Washington Bridge in NYC, so basically 32 years of my life. Yeah, I know that was a little random. Hoppy aroma, fresh, with spicy black pepper on the nose. Citrus orange flavors kick things off, very clean and inviting. Sugar sweetness and fruity pineapple are there, but they seem to be scared of an aggressive spicy black pepper assault. The spice reminds me a bit of Dogfish's 90 Minute IPA (which is a compliment, but also why I like 60 Minute better). A dash of pine is there, and the alcohol, whatever percentage it is, makes itself known right afterward. Dry finish. 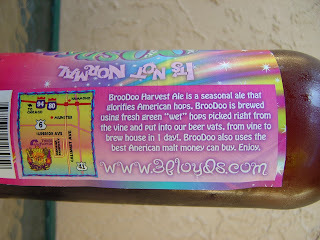 Definitely a bitter beer, aggressively hoppy, and to be honest, my palate is ruined after drinking all 22 ounces. However, I will also say that with a little warmth (which is where I am going to suggest you begin), you start with a sweeter balance and the freshness shines through even more. Nice beer, check it out for sure!